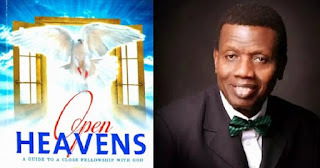 OPEN HEAVEN [16 APRIL 2019] STRAIGHT TO THE POINT - Open Heavens Daily Devotional Messages, By Pastor E.A Adeboye. Psalm 138:2 tells us that God even magnifies His word above His Name. The enormity of this statement is amplified when you realize that His Name is above all other names in heaven and on earth, and that at the mention of His Name every knee must bow (Philippians 2:9-11). It is therefore not surprising that God only speaks whenever it is absolutely necessary, and His words are usually few and straight to the point. When God speaks to you, it is better you pay close attention to every minute detail of His words. As partakers of His divine nature, God expects us to be like Him by going straight to the point whenever we have the opportunity of communicating with Him. Jesus manifested this desire in His interaction with people when He was with us here on earth. In today’s Bible reading, when Jesus asked the paralyzed man, who had been suffering for thirty-eight years, if he wanted to be healed, He expected an answer that was straight to the point, but what He got was a rambling speech. However, Jesus mercifully healed him. (Open Heaven 16 April 2019) Tuesday Daily Devotional By Pastor E.A Adeboye – Straight to the Point. Labels: (Open Heaven 16 April 2019) Tuesday Daily Devotional By Pastor E.A Adeboye – Straight to the Point.